Happy Friday the 13th! While the rest of the day may be unlucky, at least with this blog, you’re lucky to get a great list of things to read today. Kamui Cosplay has a great tutorial on using expanding foam for prop making. You can find this stuff in a can at home improvement stores, with names like “Great Stuff” (it’s used to seal and insulate cracks in houses). While it is certainly “great stuff” for some applications, it is a polyurethane foam, so you should only use it in a well-ventilated area and it should be allowed to cure in an area with separate ventilation from where you are working. If you work at home, you especially should not let this stuff cure in your house, where it will off-gas toxic and irritating fumes for 24 hours or more. Over at Theatre Projects, Jesse Gaffney makes a half-eaten chicken carcass. With just bits of wood, some Model Magic, muslin, and a few coats of latex and Glossy Wood Tone, she comes up with a pretty convincing prop that looks like it came straight from someone’s fridge. Here’s a great tutorial on turning clear glass into tinted glass. It is not useful for glass jars that need to be filled with water, but it uses nothing more than Mod Podge, food coloring and an oven. Make Magazine reminds us that it is not only useful, but vital, that we document the process of building our props. Taking process shots is useful not only for your own portfolio, but it can help with the creative process itself. It is also helpful with sharing your work with others, since others can learn from your process, even when you think what you have done is simple or common knowledge. A book called 507 Mechanical Movements has been around for awhile, and a number of reprints can be found at bookstores and online. Now, you can view all 507 mechanical movements online as well. The website is great because it has animated some of the movements, and has plans to animate more of them. These movements are useful when building moving or trick props, and you need to figure out, say, how to make a prop spin when you pull a string, or how to make a rod move in a straight line using a spinning motor. If there is a specific type of prop you want to build, or a specific style or medium you want to work in, find the companies that specialize in that. Fill your portfolio with that kind of work. If you want to build sci-fi weapons for instance, but all your previous work is in constructing furniture, employers won’t necessarily make the leap that your furniture construction skills will translate into sci-fi weapon-making. Even if you have to build your own props on your own time, do it. This is also true for skills you lack; a lot of theatres with a one-person prop shop are looking for well-rounded prop makers, which includes being able to upholster. I never learned how to upholster, so I started practicing it every chance I could get, and taking on any little upholstery project I could. Once you are out of school, no one will be around to guide you with what you need to learn next, so you should always be experimenting with new skills, new materials and new techniques. Read my book online now! Okay, you can’t read my whole book online. But I do have two whole chapters you can check out on The Prop Building Guidebook’s companion website. What are these chapters, you may ask? Well, as you can imagine, prop making covers a vast amount of information, and choosing what to put in and what to leave out was one of my biggest challenges. We could have made the book longer, but that would have pushed the price up, which we didn’t want to do. We could have made the pictures smaller, but that would not be good either. In the end, we decided to take the last two chapters and put them up on the website for free. This way, the book can remain affordable, the pictures can remain a decent size, and you get a sneak peek at some of the book. These chapters have been edited and proofed just like everything else in the book, they just appear online rather than in print. The two chapters are called “Formal Training” and “Maintaining a Portfolio”. The first digs through the tricky question of what kind of training or schooling you may wish to pursue to become a better prop maker. Vocational classes, colleges and universities, graduate schools and more are talked about here. I also look at the various types of jobs and work one can get. I present information useful whether you wish to be a prop maker for film, television, theatre or any of the related industries, and whether you wish to pursue a full-time job or work as a freelancer on different gigs. It can be a tricky field to navigate, so I try to present as much information as I’ve gleaned along the way. The second chapter gives an introduction on creating and maintaining a portfolio of all the work you do. I discuss both online sites and paper portfolios; though paper portfolios have become far less prevalent these days, I’ve still used them in the last couple of years, both in applying for work and in hiring people. This chapter also discusses photography and how to take better pictures of your work. A bad picture of a good prop can make it look like a bad prop. 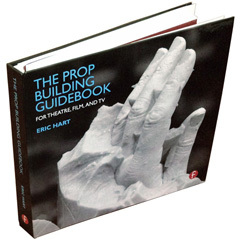 So check out the bonus chapters of The Prop Building Guidebook when you can. And don’t forget to pre-order your copy if you haven’t already! I try to photograph all the props I make. It’s a good habit to have. Look at the box above. 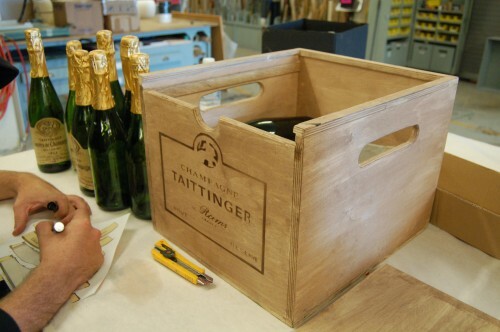 It’s a champagne box I built a few years ago. There’s nothing terribly special about it, and I will probably never put it in my portfolio. I took a picture of it anyway. What is the cost of storing a digital image on your harddrive? Realistically, it is close to zero. You can store images and files online with a variety of free sources. You have no reason not to take a picture. When I was first building props, I did not have a camera. I bought disposable cameras from the drug store and used them to take pictures of my props. I then had to get the film developed and scanned in to a computer. These days, my phone has a camera. Most phones have cameras. Even if your phone does not have a camera, chances are there is a camera nearby that can take a picture. In other words, you can’t use “I don’t have a camera” as an excuse to not have pictures of your props. Why would I photograph props if I have no intention of putting them in my portfolio? First, my portfolio layout may change. I may not have much use for a picture of a box. Maybe after a few years, I’ve constructed quite a few interesting boxes. Suddenly, I have a potential page in my portfolio of boxes I’ve constructed. I wouldn’t have that opportunity if I did not take the pictures in the first place. Basically, the cost of taking and keeping a photograph is so minimal that taking one and never using it is so minimal compared to not taking one and wishing you had. Just take the picture. I don’t know of any serious prop masters who will ever object to one of their artisans spending a few seconds to take a photograph. The fact is that no one else is going to photograph your props for you. No one is going to be checking to make sure you are keeping your portfolio up to date. No one is going to be asking whether you are documenting your work for future reference. It is entirely up to you. Speaking of taking photographs for portfolios, I will be at USITT next week, and I will be reviewing some portfolios. It looks like portfolio reviews are divided up randomly, so if you are in my slot, congratulations. If you are not but you still want to stop and say hi, I will most likely be at the S*P*A*M table for some time frame (to be determined later). You can also contact me directly if you really want to meet up in Charlotte.